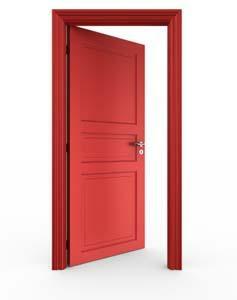 Taking the time to learn how to fix a sagging door will not only help keep the door operational, it will help you avoid the costly, time-consuming task of having to replace the door and jamb all-together. What Causes a Door to Sag? Over time, a very heavy door will start to sag as a result of the strain it's putting on its fasteners. Simply put, the fasteners just can't support the door's weight. This will cause the top part of the door to lean away from the jamb just enough to stick in the jamb or grate along the floor. For most interior door installations, the framing is secured using a few 6d finishing nails. The door hinges are then screwed to the framing using relatively short wood screws. Neither one of these materials are suitable for holding a door of any weight and more times than not, the screws will pull out of the wood, stripping the holes or the framing itself will start to pull away from the wall. Another reason a door can start to sag is good, old-fashioned house settling. Over the years, a house can settle, causing a door frame to become slightly out of square. One of the quickest and easiest ways to fix a sagging door is to replace the screws in the hinges, but there is a more effective way of doing this than just swapping out the screws. Starting at the top hinge, remove two of the screws (the top and bottom ones) and replace them with longer ones, preferably two inch or longer decking screws. This additional length is required so the screws can bite into the wall's stud framing on the other side of the door frame. Do the same thing for the top and bottom screws on the lower hinge. For particularly heavy doors, it's a good idea to remove the doorstop and use the same deck screws to secure the jamb to the stud as well. This will help eliminate twisting of the door jamb. Screw a two inch deck screw through the door jamb above and below the hinge plate at the point where the doorstop is located. Once the doorstop is replaced, it will cover the screws so they are unnoticeable. If when learning how to fix a sagging door you realize that the problem is not a loose hinge but a settling issue, a simple solution is to level the door by cutting the top and middle mortises the amount that the door is off by. For example, if you determine that the door is an eighth of an inch off level, the mortises will have to be shaved down an additional eighth of an inch to re-square the door. This job requires a sharp wood chisel and a hammer. Remove the hinge pins and pull the door off of the hinge. Remove the screws holding the top and middle hinges to the door jamb. Use the hammer and chisel to cut away the desired amount of wood. Cut away the wood at the perimeter to help ensure a cleaner stop. If any high spots are left behind after chiseling, use the chisel to remove them by hand. Reinstall the hinges to the door jamb, set the door back in place and reinstall the hinge pins. Open and shut the door to check for smooth operation and you've learned how to fix a sagging door.